140 grams or 5 ounces. 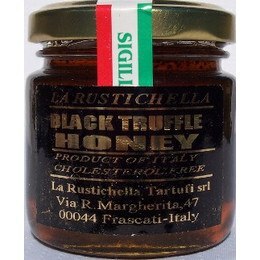 This Truffle Honey is made of Honey, Tuber Aestivum Vitt, known as the summer black truffle, black truffle aroma. The honey has truffles inside of it, not just infused with the aroma. Great uses are on buttered toast, or for dessert, thickened with ricotta cheese. You can also drizzle over a ripe cheese like gorgonzola, brie or other creamy cheeses. Try on Ice Cream for a different, yet delicious change. This makes an excellent glaze for ham!